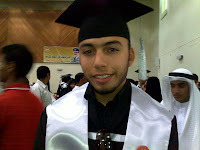 Coolred's Rant: My Son the Graduate...Proud Momma Here!!! My Son the Graduate...Proud Momma Here!!! I want to congratulate my son Adam who graduated high school today. He averaged 94% and has been an A student every one of his 12 years of school. He is a wonderful son and a joy to mother...and Im soooo freakin proud of him. Now for him to go to engineering school (his interest is airplanes) and to become something wonderful and brilliant...so he can take care of his mother in a fashion which she will definitely become accustomed too....lol. Congratulations my little boy...you worked hard, suffered a lot but still came through with flying colors. I love you sonny. Oh mom I'm so excited for you! Tonight, I have the feeling that you will receive the long awaited thank you for all your sacrifices that your ex may not get to hear from Adam. I look forward everyday to that moment. Habibty, he looks so mature and sweet. I'm sure that Airplanes will be lucrative for him, hey he can update and upgrade faulty 1950's planes in the Arab world with his engineering expertise. God knows we don't need another big plane crash. Congrats and you know what? Have a cheat day Red, you've more than earned it. MABROOK!!! to mother and son. Intelligent, sweet, and handsome--outstanding! Does he have a school picked out (or has a school picked him)? A specific country, state, province? No matter, he has Mom's brain and strength, and will do well wherever! Hey! congrats! My son's also a graduate! Lisa...ty...lol...I had some celebration cake...but just a bit. Chiara...ty..he is still deciding on that front...slooooow poke about important things. I havent been able to train that out of him...sigh. Mostlypurple...ty and congrats to you and your son as well. Happy days for everyone today!!! Congrats to you, Adam and the rest of the kinfolk. A little piece of good goes a long way when taken care of properly. Your care has manifested in to this today, it'll do so into better and better things tomorrow. Kudos to Adam. Good job mate! And to you CoolRed, as well. Adam looks like such a sweet young man, I'm sure you're very, very proud. As you should be! Best of luck to Adam, in anything he does. FK...ty..passed your well wishes on. Janice...ty...he is a sweet boy. Hmmmm, resisting professorial tendancy to expound on DEADlines!!! Chiara...was that a hint of some sort...lol. Ange...all my kids are similar in coloring etc. That's my version of professorial SUBTLETY--though I do feel like tattooing it on some. Not the Muslim ones of course, that would be haraam. I just tell them to remember this is North America, and a TIME IS MONEY--theirs!!! and forgot to say mabroook to coolred. Lisa : "upgrade faulty 1950's planes in the Arab world with his engineering expertise"
Awesome! Congrats! All your hard work paid off! Coolred38, what a wonderful blessing you have, a handsome, intelligent young lad for a son. God is Great! I could imagine the immense joy you must feel. I share with you, from a far, your joy and happiness. That was good news. I can't stop smiling. Ana...thank you...sorry I didnt see your reply earlier. E.R....I will tell him he is considered handsome...not that he didnt have a clue considering how much time he spends primping...lol. Thank you. The Funeral of a "Hell Raiser"
Is it a coincidence or what? Be Careful Washing Your Delicates!!! I LOOOOVE My Jeep..You Haters Can Bite Me!! !